Ah yes, I remember a time when I ate at Bino's... Wait, do I really remember? That was a heck of a long time ago! But really, who can forget the classic round windows and horrific early 80's decor? I'm sure the food wasn't that great, yet being a youngster, I'm pretty sure I didn't care. With that in mind, I decided to drag my kids out to the last remaining location as well as a very skeptical Costanza and Elaine. They weren't really impressed with my decision and how could I disagree??? 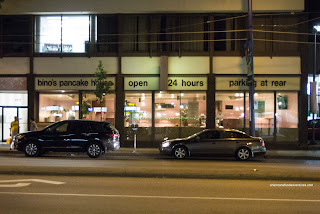 I'm pretty sure the signage out in front was misleading except for the free parking because they are not open 24 hours and I wouldn't dare try a pancake there. On the flip side (is that punny? 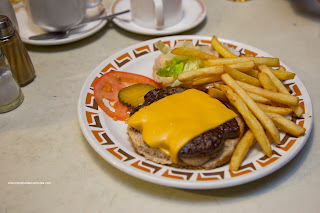 ), we fed the kids their Cheeseburger special because one could get 2 for $10.99. It was pretty much a basic frozen patty burger with a side of Sysco/GFS fries. Nothing much to say about it other than it was edible and dirt cheap. Costanza went for something similar in the Patty Melt and really, it was same thing with 2 slices of grilled white bread rather than a bun. Much like the burger, the patty was not too dry (so somewhat of a positive). The side of onion rings were the frozen variety as well. For myself, I wanted something with a mystery all-purpose brown sauce. Call it the Knight & Day effect... 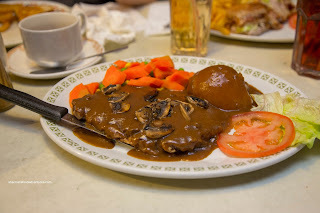 So I had the Veal Cutlet with the aforementioned sauce with mashed potatoes and veggies. The veal was pan fried until crispy while the meat was a bit dry. The sauce was thick, floury and salty. Mashed potatoes sucked, however, the veggies were surprisingly vibrant and not completely overdone. Didn't understand the tomato and lettuce garnish though. Viv and Elaine both had the Clubhouse because they thought it would be safe. They were right. 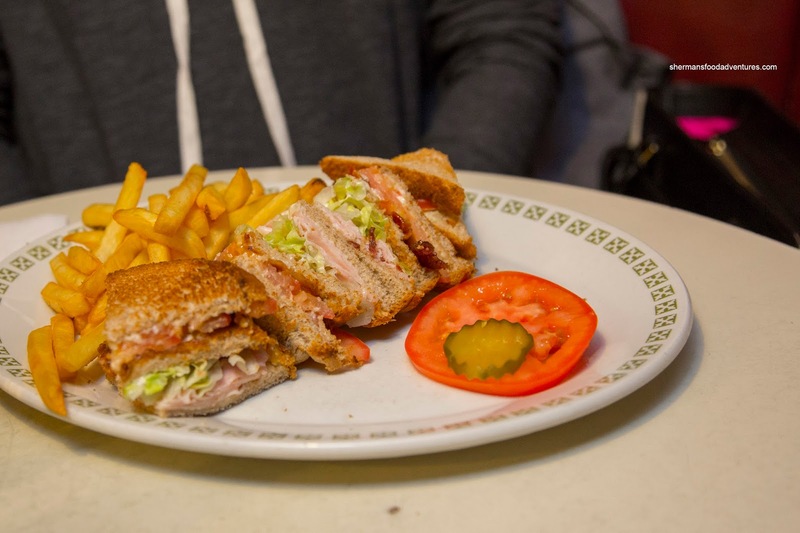 It was pretty standard with plenty of deli turkey meat, crispy bacon, lettuce and tomato. 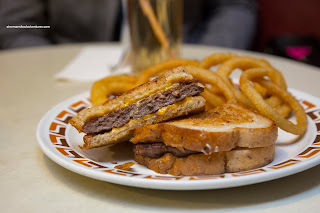 As you can see, the 80's called and wanted their diner food back. Yet, it was completely edible, if not pretty much all frozen stuff. I'm sure the prices will draw some people in still despite the completely worn carpet and ripped up vinyl booth seating. The last time I visited Binos, I thought it was pretty good. Of course that was around 2:00am, after spending most of the night in the bar, back in 1975 LOL! This last outpost just closed sometime in the past couple of months. End of an era.